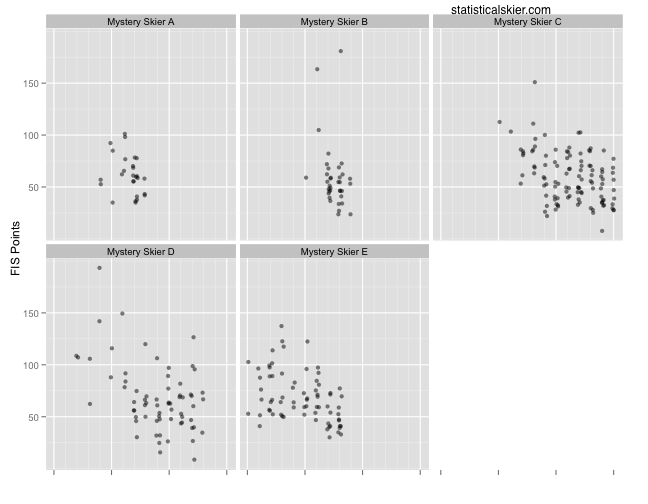 Statistical Skier : Prediction Game: Results! It turns out I didn’t ask my question very clearly, because I had to keep updating the post with clarifications. So that’s my fault. Maybe this time I’ll do better. 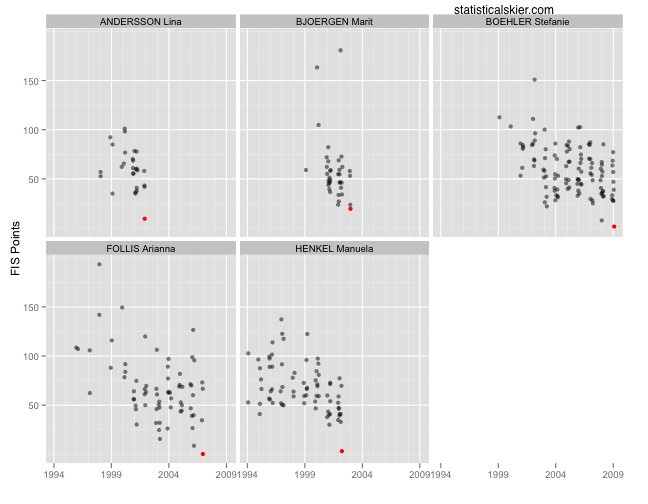 What I did was plot a part of the time series of FIS points for these five women. The x axis is time, and the large white grid lines represent around five years. So the “next race” for these five skiers will not be the same race. They’re not all about to race against each other. My question was for you to pick which of the five would have a top three result in a WC, WSC or OWG in their respective next races. I provided a few more pieces of information: at least one of the women will succeed (so the answer isn’t “none of the above”) and the one(s) that do, it will be their very first career podium. Each racer’s next result is shown in red, and they are all top three finishes. All but Marit Bjoergen’s (2nd place, with a large FIS point score because Bente Skari absolutely demolished everyone that day) were 3rd place finishes. Now, I didn’t really expect anyone to get this right, and no one did. But that was kind of my point, as you might have guessed by now. Predicting results, even very short distances in the future, is hard. At least, it’s hard if you want predictions that are precise enough not to seem dumb[1. I hereby predict that Petter Northug will finish in the top ten in more than half of the distance races he completes next season. Will you be impressed if I’m right?]. On the other hand, I didn’t give you much information to work with. FIS points arguably aren’t the most indicative piece of information here. And there is certainly much more information out there that we might consider using if we wanted to do this more seriously. Posted by Joran on Friday, September 3, 2010, at 11:00 am. Filed under Uncategorized. Tagged arianna follis, Distance, lina andersson, manuela henkel, marit bjoergen, podium, prediction, stefanie boehler, women. Follow any responses to this post with its comments RSS feed. You can post a comment or trackback from your blog.